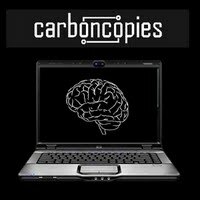 Sentient Developments: Carboncopies: "Realistic routes to substrate independent minds"
"The strong neuroscientific consensus is that behavior and experience, phenomena correlated with what we consider the mind, emerge from biophysical functions that are adequately described in terms of classical physics. These processes (and in fact, even quantum physical processes) are computable. It follows that the mind is computable ..."
I remember, that several respected neuroscientists said, that "we" still do not really know, how the brain works (sorry, I don't remember more than that). Because of this (neuroscience not being my profession) I would say, the conclusion above -- "the mind is computable" -- is rather premature, and that the statement about the strong consensus is rather questionable. As a mathematician I know something about computability (there is a ripe mathematical subdiscipline). Certain parts of mathematics being very interesting and relevant for applications in physics, engineering, and computer science, are not based on computable things alone. Gödel's incompleteness theorems, the halting problem and its variants, come to mind and are most relevant here. A popular example is the fact, that the decision, whether a program contains a virus, is not decidable generally. Human beings are able to invent original mathematical proves for hypotheses, that are not logically implied by what is previously known -- the decision about true versus false cannot be computed. Examples are Gödel's incompleteness theorems and the halting problem themselves, and there are many, many other. How do human beings do this with their supposedly computable minds? An open question!